Devyn and Joe were set up on their first date through a mutual friend, she would later be the flower girl at their wedding. The couple hit it off instantly and moved in together very quickly. Friends said, “They were like an old married couple from the minute they met.” Joe proposed after a year and a half together, Devyn didn’t see it coming. It was during a trip to Portland where they were visiting her sister, and he proposed on Cannon Beach, an iconic location popular from movies like The Goonies. From early on the couple knew they wanted a destination wedding. They didn’t want a huge wedding, everyone from home would expect to come, and being from Southern California it would have had extravagant costs attached. As soon as they returned from Portland Devyn began researching and received an initial message from Suzy with Destify. Suzy helped them narrow down their destination, they looked through a ton of options, from the Bahamas to Hawaii, and eventually chose Los Cabos. The couple chose the Sandos Finisterra cliffside resort, due to its close proximity regarding travel time, and its great price points. Devyn said, “It totally checked off all the boxes.” They even flew out early for a site tour and fell in love with the location and resort. Devyn began planning a year out in advance with her coordinator, who was quick and responsive the entire time. The couple was even able to bring much of their own decor from home, based on personal preference and pricing. The couple loved how great the staff was at the resort, they felt well taken care of. They coordinated gift bags to be given out at check-in for their guests, which included tequila and beer cozies. They had 30 wedding guests attend, and just about everyone including the couple stayed for 5 nights or longer. They made an itinerary full of all the things they wanted to do, leaving each event optional for guests to join if they wanted too. The Thursday night before the wedding everyone had arrived and they hit downtown Cabo to explore the local nightlife and bars. The couple held a beautiful sunset ceremony on Saturday, at the beach. 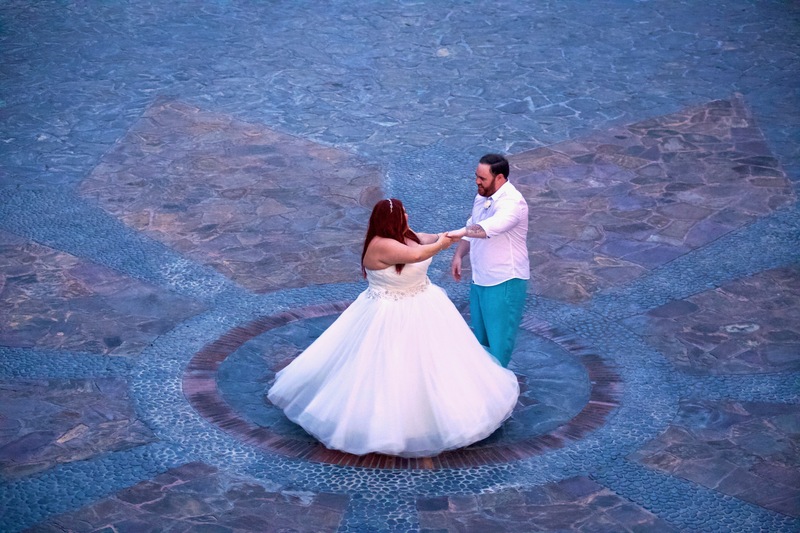 Afterward, the couple hosted their reception at the resort’s rooftop terrace, a dream venue for the couple. They loved how it overlooked the entire marina. They celebrated their first dance surround by friends and family holding sparklers. The rest of the trip was a great vacation for the newlyweds and their guests, and they even hosted a pool day at the adult’s pool, where everyone happily ordered from the swim-up bar. The couple recommends that future couples do their own research into planning and the costs of on-site vendors. They were able to negotiate prices and brought some of their own decorations to save money. Devyn even chose to bring her own centerpieces because she liked what she could get at home better than what the resort had to offer. Once we saw the rooftop venue we put down our deposit immediately.